Great Semi With A Fully Finished Lower Level And Double Car Garage. This Home Offers A Combination Living/Dining Room With Hardwood Floors And Pot Lights, Eat-In Kitchen, Four Spacious Bedrooms, Master With Ensuite, Exposed Aggregate Front Walkway And A Nice Deck In The Fully Fenced Private Rear Yard. 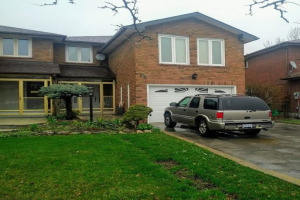 Short Commute To Toronto, Walk To Schools And Go Transit. Easy Access To Highways And Walk To Downtown Village Of Streetsville. Incl: Elfs, Window Coverings, Fridge, Stove, B/I Dw, Washer, Dryer- Excl: Tenants Chattels.